Feeding and Nutrition of Nonhuman Primates is a report of a two-day meeting that aims to evaluate the knowledge and information regarding the diet of primates. The meeting also aims to recommend significant information necessary to accomplish a standardized diet for this species. The study of primates' diet is relevant, because it will serve as baseline data for biomedical research. Comprised of 16 chapters, this volume starts off with the concept of selecting nonhuman primates in the biological research. The next topics are about the observations regarding the feeding behavior of the nonhuman primates and their nutritional status. Also discussed are the feeding problems encountered by imported primates. Other problem areas in the subject of diet and nutrition are also discussed, such as the effect of altering the dietary amino acids on the nutrition of a rhesus monkey and malnutrition during early life. 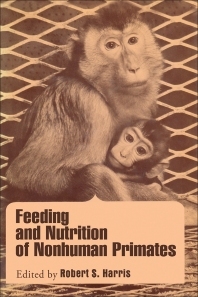 The following chapters describe the nutritional requirements of nonhuman primates including macaque monkeys, Cebus monkeys, squirrel and woolly monkeys, marmosets, and baboons. The observations regarding their feeding behavior are also discussed. Topics regarding nutritional deficiency diseases as well as their syndromes and diseases affecting their usefulness in nutrition research are also covered in this book. This compilation of research is a relevant resource for professionals, scientists, and researchers in primate studies and biological/biomedical research.